Gavin: What got you interested in fantasy and how were you introduced to the genre? Josh: I’ve been a fan of the fantasy genre since childhood. While living in Mulvane, Kansas, I discovered a science fiction fantasy novel by Madeleine L’Engle called A Wrinkle In Time. The story focuses on a young girl whose father ends up missing while working on a government project, as well as on several supernatural beings who take her on an adventure through the universe to reunite with her father. Gavin: How was it for you growing up and taking a bigger interest in more areas? Josh: Even as an adult, reading about fantasy worlds is incredibly fulfilling. When reading these books, I get to see the world through the eyes of the conquering peasant hero who always wins the battle against all the odds. To see the knight conquer the dragon, even though the dragon is twice as big and twice as strong, is so rewarding. It’s a great escape! Gavin: How did the idea come about to start up a convention? Josh: I love fantasy art, and over the years have assembled substantial collection that includes some of the top fantasy artists in the world. My original plan was to open a fantasy art museum. Then, several years ago, we looked at taking my family on a vacation to Disneyland. Growing up, I did not have much money and did not take vacations, so this was a really exciting event for us. But when we looked at the cost, it was incredibly expensive. At that moment, I realized that I wanted to offer families an affordable experience that is as good as anything you can find at Disneyland. Gavin: I read elsewhere that you've been planning this for years. How did the work start out and what was the progression like over time to get it to the point of execution? Josh: I have been planning FantasyCon for more than five years. In the early stages, I considered having FantasyCon in a high profile location, like Las Vegas. But in my heart I wanted to do it right here in my home – Utah. Once my plan came together, I presented the idea to my investors. They saw my passion, realized that this was something that is not being done anywhere else and quickly bought into the idea. Ever since then, FantasyCon has been my love, sweat and tears. We’ve been working non-stop with top artisans and talent from around the world to bring various fantasy worlds to life. I sometimes worry about all the time this has taken me away from my family, but it all becomes worthwhile when I imagine the looks on my kids’ faces when they step into this magical realm for the first time. This is the best gift I can give to them. Gavin: How much of an influence did the Salt Lake Comic Con and all its events have on you as far as recent planning and pushing forward? 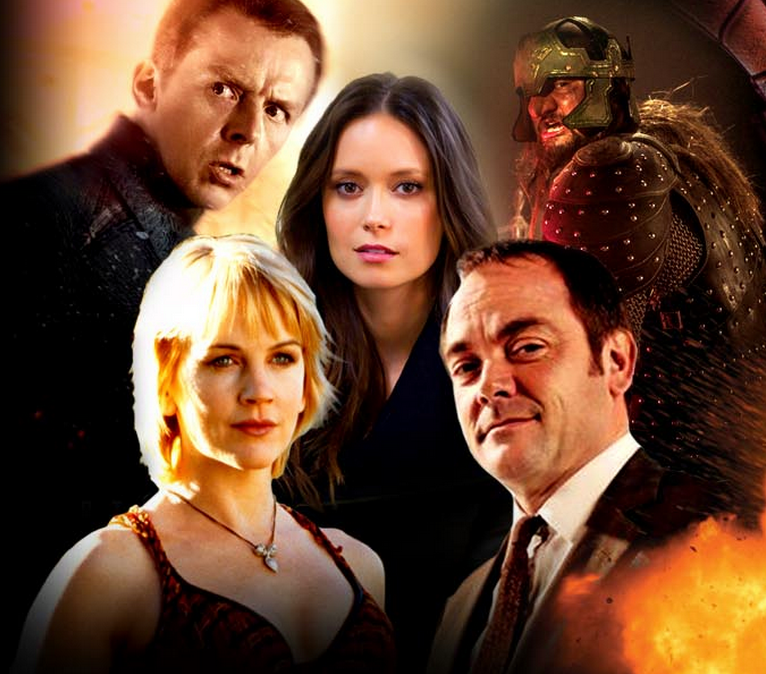 Josh: As I said earlier, FantasyCon has been in the planning stages for more than five years. The convention was born here and will stay here. We are bringing a vacation-style experience right to our own backyard so everyone can be part of the adventure. 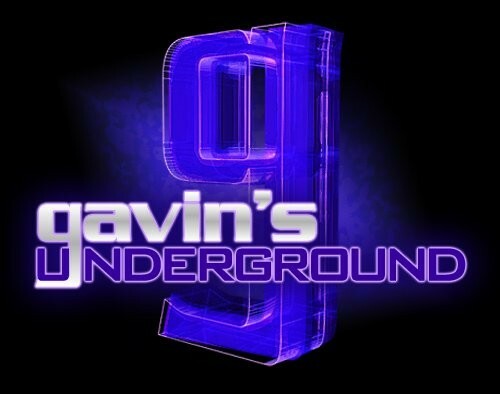 Gavin: Knowing that you'd be taking over the Salt Palace after two major events there, what kind of planning did you start making so that it would be an entirely different experience when compare to them? Josh: We are creating an experience. While planning this event, I traveled to almost every convention imaginable. While they were all enjoyable, they were all very similar. You have celebrities, booths, vendors, and that’s about it. We wanted something you can bring your kids to. Something you can plan a vacation around. And, most of all, we wanted to bring this experience to Utah. Gavin: One of the more hyped elements are the big constructs that will be there, including a large dragon. Can you tell us more about these giant displays being brought in? Josh: The sets we are bringing in rival anything you would see in a movie studio – they are simply amazing! We’ve got a three-story tall, smoke-breathing dragon with a wingspan of more than 53 feet that we believe is the tallest dragon in the world. And, when guests walk in they are greeted by two 30-foot-tall sentinels that are unbelievable! It reminds me of that river scene in The Lord of the Rings. 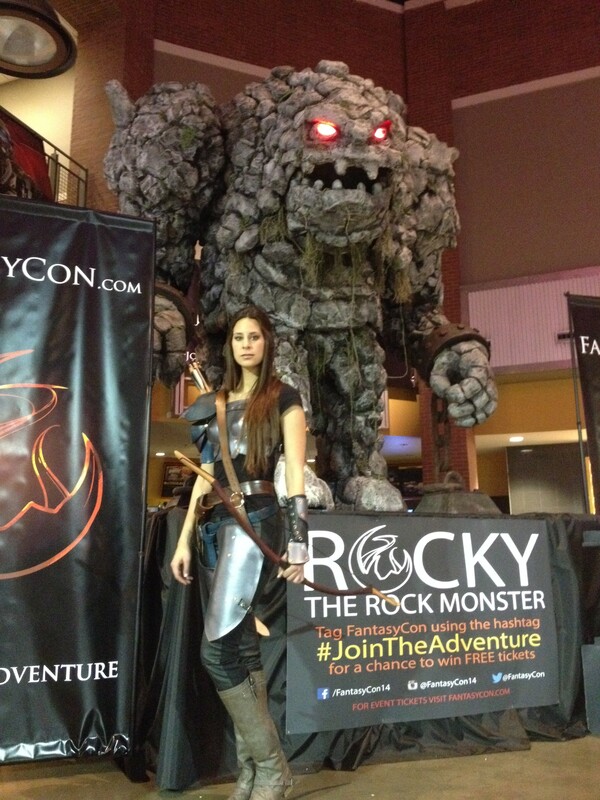 We’ve also got our 15-foot rock monster, appropriately named Rocky. He’s been on display at The District Megaplex Theater and is now being placed in the lobby of the Salt Palace. We’ve also got some great places for photos, like our castle sets and the indoor fire pit. Gavin: As is with most cons, you're going to have a Cosplay competition. What should people know about it prior to dressing up and coming in to participate? 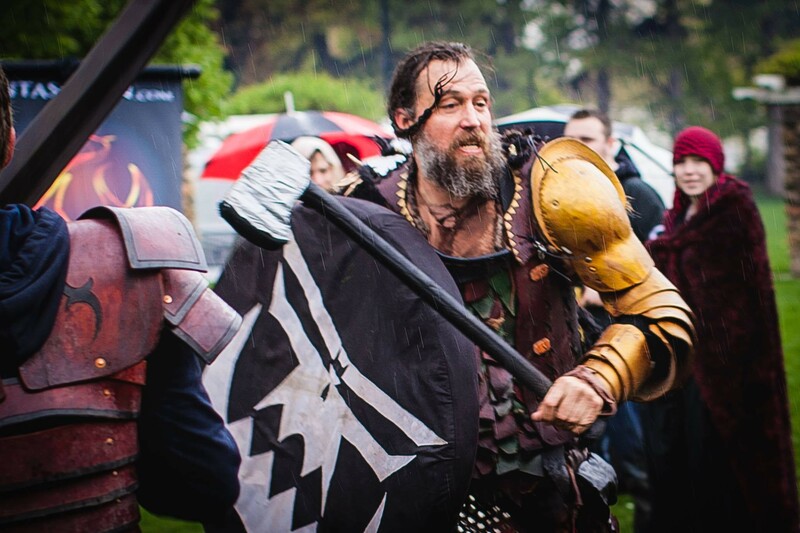 Josh: FantasyCon’s cosplay competition is offering $10,000 in prizes, one of the highest prize amounts in the nation. It’s open to novice cosplayers, all the way to the most advanced levels. We’ve got a roaming contest for cosplayers who don’t’ want the stage spotlight, a youth contest for children 15 and younger, a Creators’ Contest to recognize people who have really put their heart and soul into their costumes, and the Quest for Emberfire contest for cosplayers who truly embody their characters. Gavin: You're also going to have a tabletop competition area. What do you have planned for that area, and what specific games will we see there? Josh: We’ve got an entire area completely dedicated to tabletop gaming, and game demos and tournaments are happening from the time we open until the time we close. We’ve got something to appeal to most tabletop gamers, including Magic: The Gathering, Dominion, Zombie Dice, Settlers of Catan and Giant Chess. Gavin: Another area that will be on display is an artistic display. Who will be on display for people to check out? Josh: FantasyCon features masterworks from the top fantasy artists in the world. Many of these artists are unveiling paintings they have been working on for years. Donato Giancola has been working for three years on a painting that depicts a scene from The Fellowship of the Ring. At 6 feet by 10 feet, we believe this is the largest Tolkien-themed painting in the world. Heather Theurer is also unveiling one of her paintings called Triumph. If you check out Heather’s gallery, you will also see some amazing painting she’s done based on the Disney princesses. Brom is another legendary fantasy artist coming to FantasyCon. He made his mark developing and illustrating for TSR’s best-selling role-playing worlds. 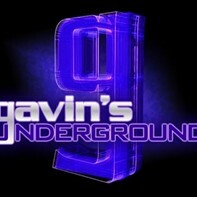 Gavin: I read that you're also planning to have a battle arena, can you explain what will be happening in there? Josh: There will be some truly epic battles taking place at the battle arena during FantasyCon. Several local role playing groups are joining us to participate in battles, all while the Salt Lake Pops Orchestra plays heroic themes. There will also be some opportunities for guests to be part of the action by training to use some of the battle weapons. Another highlight of the battle arena is the Dragon Warrior Training Academy, where guests can earn how to battle, and survive, a dragon attack. Gavin: Aside what we've already covered (and FilmQuest covered separately), what else are you planning on bringing to the event? Josh: We kicked off the week on Monday, June 30 with the beginning of FilmQuest, the second largest film festival in Utah. On Wednesday, July 2, we’re hosting a VIP kickoff party at The Complex with our special guest DJ Elijah Wood. We’re also hosting our Night of Dreams preview event on Wednesday night for families of special needs and critically ill children. 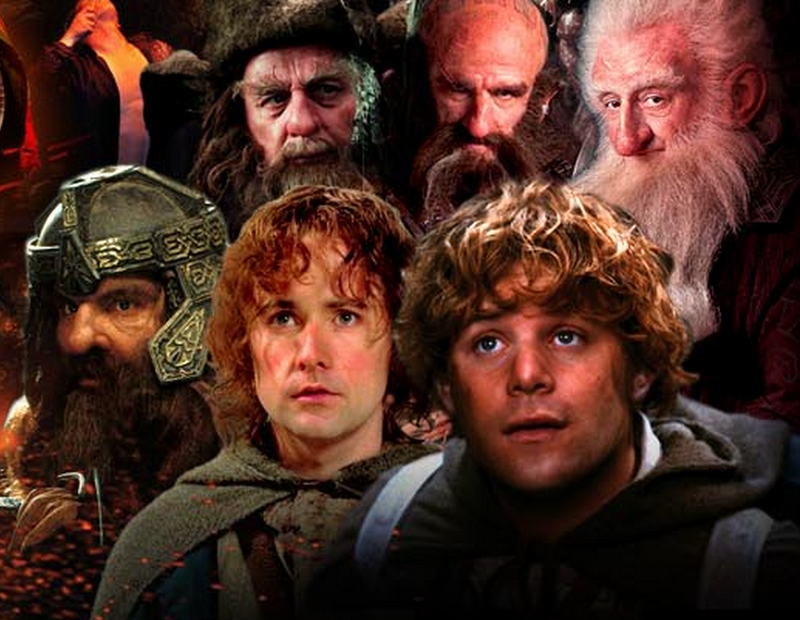 FantasyCon opens Thursday, July 3 and we’re going to have special events including the largest gathering of celebrities from The Lord of the Rings and The Hobbit film trilogies ever assembled in the history of the world, a special screening of Troll 2 with the entire cast and a casting call for The Quest. That’s not including all of the artists, panels, costumed character interactions, Dragon Warrior Training Academy, mystical creatures and other guests that will be at FantasyCon. On Friday morning, July 4, we’re hosting a parade from 8:30 a.m. to 10 a.m. It’s a celebration of freedom and fantasy and we’re inviting everyone to come out and line the street between The Gateway and the Salt Palace for a parade of costumed characters, bagpipers, FantasyCon Dragon Teams and floats. On Saturday, July 5, we close out the convention with a street festival at The Gateway capped off with the largest fireworks display in Salt Lake City! You can see a full schedule of events on our website. Gavin: Once the convention is over, are you going to try making it a year-round thing like Comic Con has, or focus more on making the single event the best you can? Josh: FantasyCon will become an annual event. Our projections expect us to have 40,000 – 50,000 guests this year, and I know that each year we will get bigger and better. We’ve already got the Salt Palace booked for the next few years. Gavin: Considering the many conventions that have popped up in the past five years, what are you hoping Fantasy Con will add to that selection that others haven't? Josh: FantasyCon is a theme park-style experience. Yes, we have some great celebrity guests, but we also have aerial dancers, motion-capture trolls, blacksmiths, fire eaters, artists and much, much more. We are turning the Salt Palace into another world with a giant three-story-tall tall dragon, an animatronic rock monster, a battle arena and huge set pieces. When people come into the Salt Palace, we want them to think that they’ve gone to Universal Studios or Disneyland without leaving the state. I can’t fully describe how amazing the experience will be. You’ll have to see it to believe it.